SACRAMENTO, California — What do you think about the Colin Kaepernick national anthem protest? How do you handle losing? How do you deal with adversity off the court? Those were a few of the questions Sacramento Kings forward Garrett Temple fielded during his first day as a student-athlete mentor at Sacramento Charter High School. Temple, who is African-American, said he began thinking about adopting a school during the offseason because of the race issues in America. He ultimately decided that he wanted to become a mentor to student-athletes as well as offer financial assistance to a local high school that primarily included underprivileged kids of color. Sacramento Charter High fit Temple’s criteria. Sacramento Charter High is a predominantly black school that also includes Latino and mixed-race students. It is in Sacramento’s challenged Oak Park neighborhood, and the school’s alumni include former NBA star and former Sacramento Mayor Kevin Johnson. Temple credited Galen Duncan, vice president of the Kings Academy and Professional Development, for doing research that identified Sacramento Charter High as a solid choice. Temple also plans to donate money to the school for computers, which he expects the Kings to match. “Sacramento High felt like a place that could really use some help. That is why I chose it,” Temple said. Temple’s town hall meeting at Sacramento Charter High on Dec. 6 was the first of several he plans to have with students playing basketball and other winter sports. He plans to attend a boys’ basketball tournament at the school to show his support and perhaps even talk to some teams individually. During the first meeting with the Sacramento Charter High kids, Temple mostly answered questions about life off the court. He was impressed that he received strong attendance of about 100 enthusiastic student-athletes. “With Colin kneeling and other things going on bringing awareness to police brutality of that nature, I thought about things I can do to actually help,” Temple said. “The education gap in this country is something that is not talked about anymore because there are so many other problems. I read a statistic that said we may be more segregated in schools now than we were in 1954 because of the private schools. All the white kids are going to private schools, while the black kids are going to public schools that are very underserved. Temple said Kings veteran point guard George Hill also chose a local school to mentor after he heard what Temple planned to do for Sacramento Charter High. 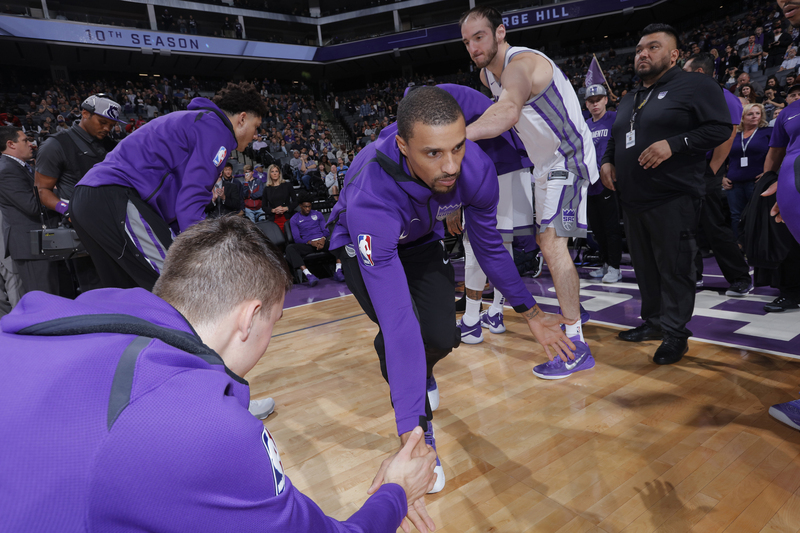 Their efforts are part of the Kings Academy, which encompasses all of the team’s charitable and outreach efforts. Temple wasn’t surprised that Hill yearned to get involved, because of his previous charity work. George Hill (No. 3) of the Sacramento Kings. Hill’s reasons for participation were similar to Temple’s. Hill chose Sacramento’s Encina Preparatory High and is scheduled to meet with student-athletes there Monday in the first of what he hopes to be a monthly meeting this season. Hill said it was important for him to be in a school environment that had black and Latino students because “most of those schools are looked over.” Hill’s fiancée, Samantha Garcia, is Latina, and he is African-American. Racially diverse Encina meets Hill’s criteria, as it is 37 percent Latino, 29 percent black, 21 percent white and 6 percent Asian, according to School-Ratings. Moreover, 93 percent of Encina’s students are eligible for free lunch. Hill plans to talk to the students about his challenges growing up in a tough neighborhood in Indianapolis, leadership and working hard to meet their dreams and goals. Hill and Temple also could offer kids motivation with their far-from-easy roads to the NBA. Hill starred in college at little-known Division I mid-major Indiana University-Purdue University Indianapolis (IUPUI), which has made the NCAA tournament just once in school history. Despite scholarship offers from Temple and Indiana, he chose IUPUI to stay close to home with his ailing great-grandfather, Gilbert Edison, who died before getting a chance to see him play. The 10th-year NBA veteran was selected 26th overall in the first round of the 2008 NBA draft by the San Antonio Spurs. “Anything is possible if you put your mind to it,” Hill said. “Believe. Hard work pays off. I wasn’t one of the nation’s top players coming out of high school. Everything we had to do had to be earned. It wasn’t given to us. With some of this new generation, people give them so much that when they have to go on their own, they are misguided. They don’t know how to work for it. Temple grew up in a stable home in the suburbs of Baton Rouge, Louisiana, led by his father, Collis, the first African-American to play basketball at Louisiana State University. Garrett Temple, however, faced adversity when he went undrafted out of LSU in 2009 while his former teammates Brandon Bass, Glen Davis and Tyrus Thomas were all selected in the first round. Eight years later, Temple is the only one of the four former Tigers still in the NBA. Temple’s well-traveled basketball career has included four stops in the NBA’s G League, a season playing for Associazione Sportiva Junior Pallacanestro Casale Monferrato in Italy and time with the Kings, Houston Rockets, Milwaukee Bucks, Charlotte Bobcats and Washington Wizards. The National Basketball Players Association vice president is in the second year of a three-year deal with the Kings. The Kings’ roster includes nine players with two or fewer years of experience in the NBA, including standout rookie point guard De’Aaron Fox. Sacramento also has veterans in Temple, Hill, Vince Carter and Zach Randolph, who have made it a point to mentor their younger teammates. Kings rookie guard Frank Mason and injured rookie forward Harry Giles shadowed Temple at his first town hall meeting at Sacramento Charter High. Mason and Giles served the student-athletes a dinner that included chicken, jambalaya and greens. They also sat with the student-athletes as Temple addressed them, engaged with them on social media and took pictures. Temple hopes that Mason and Giles can do something similar for a school in the future. Kings rookie Bogdan Bogdanovic is expected to be on hand when Hill makes his first appearance Monday. Temple’s and Hill’s meetings with the Sacramento high school student-athletes could offer life-changing inspiration. Temple isn’t underestimating the impact it can have on him as well. “I probably will get more from it than the kids,” Temple said. “It continues to keep you grounded. It humbles you. It reminds you that at one point you were in the same shoes as these kids and had a dream of playing professional basketball. To get here, you need to understand that it’s a blessing and you’re very fortunate.